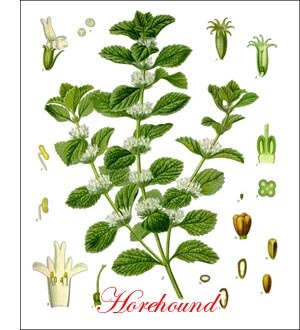 Horehound, or hoarhound (Marrubium vulgare,Linn.) is a perennial herb of the natural order Labiatae, formerly widely esteemed in cookery and medicine, but now almost out of use except for making candy which some people still eat in the belief that it relieves tickling in the throat due to coughing. In many parts of the world hoarhound has become naturalized on dry, poor soils, and is even a troublesome weed in such situations. Bees are very partial to hoarhound nectar, and make a pleasing honey from the flowers where these are abundant. This honey has been almost as popular as hoarhound candy, and formerly was obtainable at druggists. Except in isolated sections, it has ceased to be sold in the drug stores. The generic name Marrubium is derived from a Hebrew word meaning bitter. The flavor is so strong and lasting that the modern palate wonders how the ancient mouth could stand such a thing in cookery. The numerous branching, erect stems and the almost square, toothed, grayish-green leaves are covered with a down from which the common name hoarhound is derived. The white flowers, borne in axillary clusters forming whorls and spikes, are followed by small, brown, oblong seeds pointed at one end. These may be sown up to the third year after ripening with the expectation that they will grow. Spring is the usual time for sowing. A dry, poor soil, preferably exposed to the south, should be chosen. The plants may stand 12 to 15 inches apart. After once becoming established no further attention need be given except to prevent seed forming, thus giving the plant less chance to become a nuisance. Often the clumps may be divided or layers or cuttings may be used for propagation. No protection need be given, as the plants are hardy. An old author gives the following recipe for hoarhound candy: To one pint of a strong decoction of the leaves and stems or the roots add 8 or 10 pounds of sugar. Boil to candy height and pour into molds or small paper cases previously well dusted with finely powdered lump sugar, or pour on dusted marble slabs and cut in squares.